A Wish Tree is literally a Wish Fulﬁlling tree, that gives visitors like you the opportunity to fulfill the wishes of an NGO by choosing to contribute to specific needs/requirements they are posting. 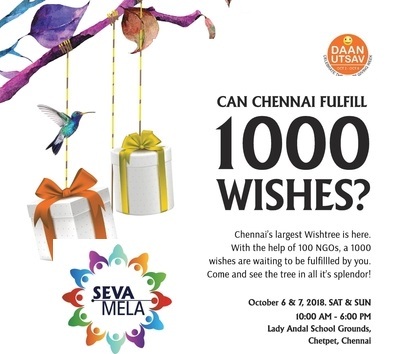 As part of Daan Utsav Celebrations, Seva Mela is installing Chennai’s Biggest Wish tree with 1000 wishes from 100 NGOs registered for Battle of Buffet. This wish tree will be installed inside Seva Mela exhibition grounds and will be open for Chennaiites to come and fulfill your wishes. This year, we are setting up Chennai’s Largest Wish Tree. We are expecting to have around 100 NGOs and around 1000 wishes to be fulfilled by Chennaiites. Every wish is a possibility of spreading a smile to the beneficiaries our amazing NGOs work with. Please do join us, spread some smiles. Do spread the word in your network.